The mother of all quiche recipes is the Quiche Lorraine, a light custard with lots of bacon in a buttery crust. But the classic Quiche Lorraine has endured, I’m guessing mostly because of the bacon! In this version of Quiche Lorraine we’ve included some chopped chives because as of this writing it is springtime, and the chives are flourishing in the garden. If you’ve never made a quiche before, don’t worry, it couldn’t be easier. Especially if you’re working with a prepared frozen crust. If not, it’s still easy, it just takes more time and planning. Onions or shallots can be used in place of the chives. Use about 1/2 cup, finely chopped, and sauté in butter first, before spreading over the bottom of the quiche crust with the bacon. 1 Rollout the dough, form into a tart pan, then freeze: If you are making your own pie crust, roll out the pie dough into a 12-inch round. 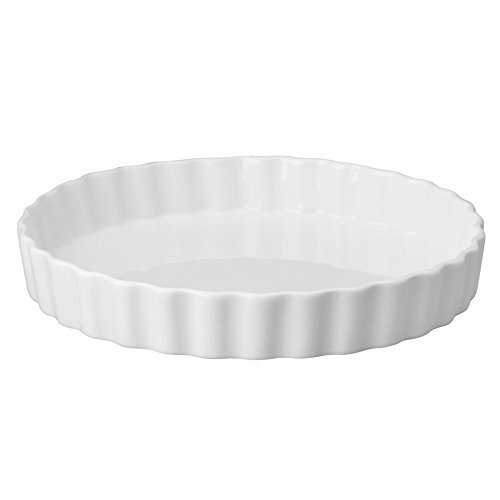 Place it in a 10-inch wide, 1 1/2-inch high tart pan, pressing the dough into the corners. Use a rolling pin to roll over the surface of the tart pan to cleanly cut off the excess dough from the edges. Freeze for at least half an hour before blind-baking. 2 Pre-bake the frozen crust: (also called "blind" baking) If you are using a store-bought frozen crust, follow the directions on the package for pre-baking. If you are pre-baking a homemade crust, preheat oven to 350°F. Line the frozen crust with heavy duty aluminum foil. Allow for a couple inches to extend beyond the sides of the tart or pie pan. Fill tart pan with dry beans, sugar, or rice. If you are using a pan with a removable bottom, place the pan on a rimmed baking sheet in the oven to catch any spillage. 3 Cook the bacon: Heat a large frying pan on medium heat. Arrange strips of bacon in a single layer on the bottom of the pan (you may need to work in batches or do two pans at once). Slowly cook the bacon, turning the strips over occasionally until they are nicely browned and much of the fat has rendered out. Lay the cooked strips of bacon on a paper towel to absorb the excess fat. Pour fat out of the pan into a jar (not down the drain, unless you want to clog the pipes) for future use, or wait until it solidifies and discard in the trash. Chop the cooked bacon crosswise into 1/4-inch to 1/2-inch pieces. 5 Whisk eggs, add nutmeg, salt, pepper, cream, milk: Whisk the eggs in a large bowl. Add the nutmeg, salt, black pepper and chives and whisk a little more. Add the milk and cream and whisk vigorously to incorporate and introduce a little air into the mix – this keeps the texture of the quiche light and fluffy. 6 Put filling in pre-baked crust: Arrange the bacon and cheese in the bottom of the pie crust. Whisk the egg-milk mixture hard again for a few seconds, then pour it gently into the pie crust. You want the bacon and cheese to be suspended in the mix, so you might need to gently stir it around just a little. You also want the chives, which will float, to be evenly arranged on top, so move them around with a spoon until you like where they are. Check for doneness after 30 minutes by gently jiggling the quiche. It should still have just a little wiggle. (It will finish setting while it cools.) Cool on a wire rack. Hello! All photos and content are copyright protected. Please do not use our photos without prior written permission. If you wish to republish this recipe, please rewrite the recipe in your own unique words and link back to Quiche Lorraine on Simply Recipes. Thank you! This recipe is dedicated to Berkeley Breathed whose Bloom County comic strip kept millions entertained daily for years, and who named a character in that strip (the sometimes girlfriend of Steve Dallas) "Quiche Lorraine". (slap!) "I'm not that kind of girl!" "Oh, pits, is it that obvious?" Questions bout pie weights. If using beans or rice can those ingredients be consumed in another recipe or does baking them ruin them for consumption? Hi Issica, great question! My mother once cooked my pie weight pinto beans by mistake and couldn’t understand why after twice as much cooking as usual, the beans were still tough. I ate them thinking, “there is something wrong about these beans”. When we figured it out, we had a good laugh. They will be edible, but you wont want to eat them. Just keep them in a sealed container and use them when you need to use pie weights. I prepared the butter crust and did the blind baking. The crust burned – do you think that 20 min plus 10 min and plus 30-40min is too much baking? Can the blind baking be shorter? Thank you. Hi Bettina, yes you can shorten the blind baking time. Can you use half & half instead of separately using milk and heavy cream? This was absolutely delicious, but very wet – after 40 minutes it looked perfect and golden brown on top, but the insides were still gooey. I switched to convection and cooked for an additional 25 minutes to cook it through and it was still a bit too moist on the inside after cooling. I’ve made quiches before and I’ve never used an entire cup of milk, so I will be making this again and will try adding an extra egg and omitting the milk (but keeping the cream) instead. The taste was really great despite the texture. Emmental cheese makes this quiche even more delicious. Would it be possible to substitute bacon for tuna? Hi, Elsa! The flavors and textures would be very different if you use tunafish, but yes, the quiche would still bake and set up just fine. Just make sure to drain the tunafish very well so you don’t add too much moisture. I’d also probably skip the nutmeg since I think that spice would taste really odd with tuna. Good luck! Delicious! I made this in a prepared frozen crust (made by a famous namebrand lady who makes pies!). The whole recipe fit just fine and I baked it for 50 minutes at 350 degrees. It was a hit at a work breakfast. Hi! Do you have any recommendations for freezing this quiche? Thanks! Hi, this recipe looks delicious, and I can’t wait to make it. But I would rather try it in my 9″ pie pan (2″ deep). Looking at some of your other quiche recipes, it looks like I will need to double the recipe. Will that work, and will increasing the bake time affect the quiche? Thanks! Hi Mary, my guess is that you should easily be able to double the filling. The bake time will take longer, but I’m not sure by how much. You’ll need to experiment! You are welcome Moya! I’m so glad everyone like it! Wonder if it would ruin it to add a veggie like spinach or mushroom?? Would it change the taste? Also, what is the key to not a soggy crust bottom? Cheese first? The next time I make this I will omit the salt. The end result was very salty to us. The gruyere and bacon give it plenty of flavor. I also leave out the salt. The bacon has plenty. I made this yesterday for my french class and it was a hit! So amazing! Everyone loved it and they even ate twice. My teacher is french and she said it was “vraiment française”. This looks terrific! I’d like to make this recipe for my french class, and I was wondering if its possible to substitute the bacon for ham? Instead of using heavy cream i used cream of mushroom soup and didnt use chives or nutmeg. Also instead of cheddar cheese i used mozzarella cheese its not as dark and not as green but dont worry because it is still gorgeous. my family loved it. I’ve made this twice in the last couple of weeks, once with white cheddar and another time with the gruyere, and both times were excellent! Thanks for the recipe! it is a very nice recipe(quiche lorraine)I loved it m full family loved it. This was a hit when I made for my mom, she loved it, great recipe! Can you use something else besides beans, because I want to make this for my mother on mother’s day and she would be suspicous if i used beans for something. ALso can I freeze the crust for 2 or 3 days? I use rice. I save it to use the next time I make this recipe.